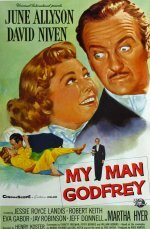 Universal did try gamely here, casting David Niven and June Allyson and throwing in the dubious benefits of colour and CinemaScope. To be fair, if you've never seen the 1936 movie, this may pass the time well enough, especially if you're a fan of either star. Trouble is, director Henry Koster helped neither of them. Niven is too often reduced to eyebrow-raising double takes, while Allyson, flouncing and flustering to little avail, seems, as ever, outclassed by her leading man. Niven is actually quite good as the butler who isn't, but he's not a patch on the worldly-wise Powell. Still, there's no point in complaining about what's not on the screen, and there's still lots of fun to be had here.